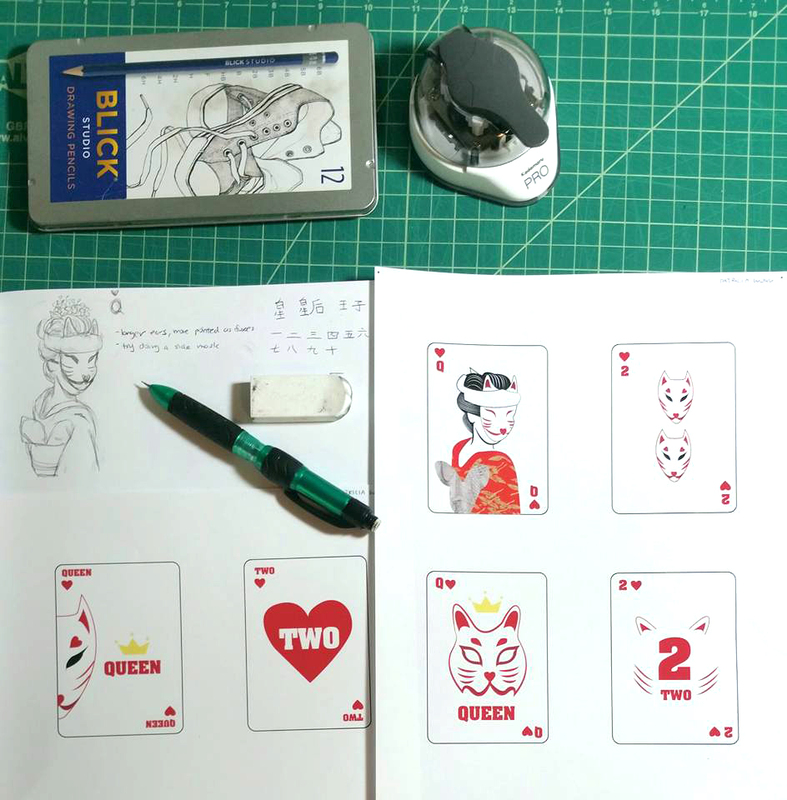 Design a deck of playing cards with an organized visual system based on a theme. The visual style of the face cards must connect with the style of the number cards. My design is inspired by the Japanese mythology involving the weather having both the sun and rain out at the same time, which acts as a veil for a fox wedding. Foxes or "kitsune" are known to be messengers of the god Inari. In the Kyoto temple, Fushimi Inari, viewers will come across the well known scene of the red gates (toris) and see many of the foxes. The cards tell a beautifully illustrated love story that reflects upon the Japanese traditional wedding as well as the red string of fate that lead individuals to their soulmates. The icons revolved around the weather, the sun, the rain, leafs (what foxes use to transform into human), and ribbons that symbolizes the string of fate. The dotted pattern represented the manga culture, Japanese version of comics. The back of the cards showed the illuminating clouds in gold foil as that is usually seen decorating the Shinto shrines.